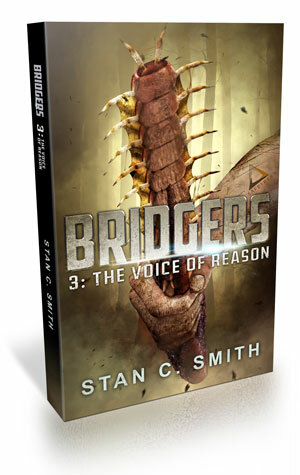 Bridgers 3: The Voice of Reason is the third book in my exciting Bridgers series. As Earth’s destruction approaches, bridgers Infinity Fowler and Desmond Weaver wrestle with the fact that eight billion people are about to die. While on the road to see Desmond’s mother one last time, they witness chaos like nothing they’ve ever seen. Infinity and Desmond must fight their way back to SafeTrek to fulfill their primary duty—saving the human species. Their next mission: bridge 718 civic leaders to an alternate world. They'll then have thirty-six hours to help the refugees find their place in this new world, after which the bridgers will return to SafeTrek—assuming the building hasn't collapsed. But when the bridgers and refugees arrive, they don’t find the civilized world they had expected. Instead, they find a ravaged planet where humans are forced to live in caves and fight for scraps. They discover creatures that shouldn’t exist and weapons that do worse than kill. How can a colony so ill-prepared for these conditions possibly survive? In their desperate attempts to prepare the refugees, Infinity and Desmond face challenges that threaten to change them forever. Get Bridgers 3: The Voice of Reason on Amazon (available to purchase or in Kindle Unlimited). "Bridgers 3: The Voice Of Reason is story telling at it's best. It grabs your attention on the first page and never lets go. This book helps to answer questions you may have about Infinity, the lead character in this brilliantly clever science fiction series about traveling (bridging) to parallel earths with small groups of people from our earth, to colonize and to hopefully save our species from extinction." "Love seeing how the series continues to grow with each new book. Great, well developed worlds and characters you really get caught up in. Definitely a series to check out." "There is heart in this story and it shows in the most magnificent ways. It does exactly what sci-fi should - makes the reader wonder what it means to be human." "This book is even better than the first two! There is astounding world building with lots of hold-your-breath suspense and action. The story is peppered with compassion and a bit of romance. Great plot with surprises around every corner. Bravo!!"